NEW ORLEANS – History dotted the NCAA Division III Women’s Indoor Track & Field National Team Computer Rankings this week. For starters, the top-5 is a bit different from Week 1 to Week 2. Williams is the new No. 1 team after jumping three spots from No. 4. This is the first time in program history that the Ephs have been ranked No. 1 and they can thank Summer-Solstice Thomas for it. Thomas posted a total of 3535 in the pentathlon this past weekend and is now ranked No. 2 in the USTFCCCA Individual Rankings. Oberlin, MIT and Johns Hopkins all fell one spot from their Week 1 billing after Williams displaced them with its big jump. Ithaca remained in place at No. 5. George Fox continued to climb the rankings as Sarah King won’t be denied in the sprints. King is now ranked in the top-5 of the USTFCCCA Individual Rankings in both the 200 (No. 4, 25.04) and 400 (No. 2, 55.27). You can’t talk about the 200 or 400 without mentioning UMass Boston’s Wadeline Jonathas. Jonathas broke the NCAA DIII indoor 400-meter record this past weekend when she clocked a time of 53.70. She is also ranked highly in the 60 and 200 – all of which is a major reason why the Beacons moved up four spots to a program-best No. 9 this week. Bates, WPI and UW-Stevens Point all moved inside the top-15. The Bobcats jumped eight spots to No. 10, while the Engineers and Pointers vaulted 14 spots and seven spots, respectively. Sydney Packard has helped WPI greatly as she is ranked No. 2 in USTFCCCA Individual Rankings in the 800 and helped the DMR team to a No. 2 billing as well. Further down you’ll find UW-Eau Claire and Bowdoin. The Blugolds saw Sarah Glidden notch a top mark in the pentathlon (3626 points) and JoHannah Theisen register a top-5 mark in the shot put. The Polar Bears now feature the nation’s fastest DMR team after it got the baton around in 11:49.86. 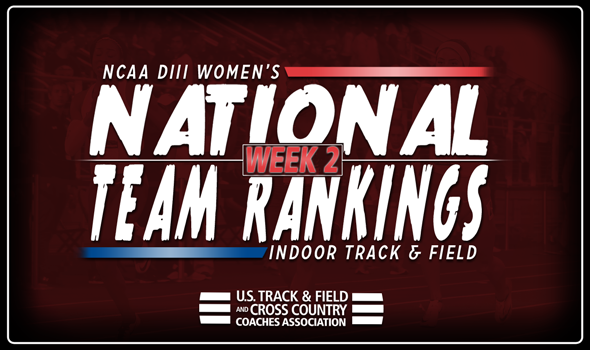 Be sure to check back in throughout the season as these rankings will change a lot between now and March 9-10 when the 2018 NCAA Division III Indoor Track & Field Championships will be held in Birmingham, Alabama.